Petrified Forest National Park is part of the Tentative list of USA in order to qualify for inclusion in the World Heritage List. 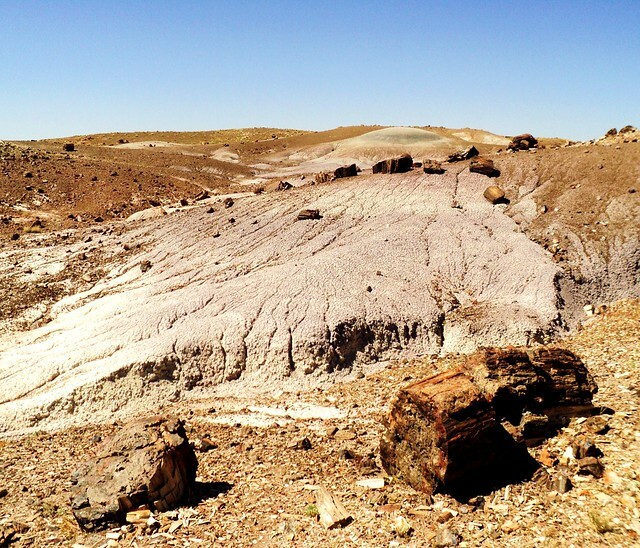 The Petrified Forest is surreal. You might imagine the surface of another planet would look like this. The landscape is desolate yet beautiful. 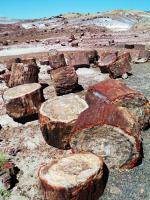 The fascinating petrified wood is scattered everywhere. The Petrified wood being hundreds of millions of years old it's a humbling display of our ancient world. The park could be separated into two unique sections, the petrified wood landscape in the south and the Painted Desert in the northern section. You need at least 2-3 hrs to visit the park properly. Enjoy this wondrous place, and if you go in the summer bring an umbrella and sun tan lotion. Recently, the park has expanded to include large areas to the East and West. This area includes countless petroglyphs and a section of Route 66 is protected in the park. The proximity of this NPS site is near Navajo Nation, which should be on anyone's itinerary if you have the time. Flagstaff is the nearest location for a central point to make trips in this part of Arizona.